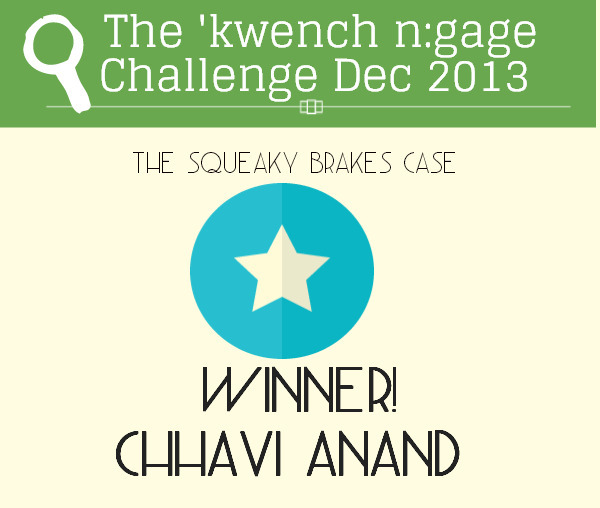 So now coming to the winning entry for the n:gage December 2013 Challenge (Squeaky Brakes). Congratulations to Chhavi Anand for the best analysis and solution of the case among all the submissions. CA: 1) Individual cash rewards in all geographies; overlooking the fact that the working culture in India(say) where collectivism is popular might not work in Americas(say) where individualism persists. A very valid point. While making a rewards strategy that spans across multiple geographies, the one-size-fits-all approach often does not work. In many of the Asian cultures, collectivism is seen as a more dominant phenomenon. Things are changing with the impact of globalization and this cultural transition (or muddle as some might say) adds to the challenge of creating a recognition strategy. In a culture where the individual identifies more with the group, rewarding just one person instead of the group might actually have a counterproductive effect. CA: 2) Giving control of cash to junior manager and team leaders; only top to bottom rewards are designed. There is no peer to peer reward system. Surveys and research has repeatedly shown that peer recognition is rated far more meaningful and fulfilling than one from superiors. Especially in the knowledge economy appreciation from peers is perceived as more valuable since it goes without saying that the peers truly appreciate the effort or the challenge involved in the solution. CA: 3) Approval from group presidents; the approval system in rewards might delay the process and lose the charm of reward and recognition. Right on! Oversight is good, but it should not be crippling. And the moment very tight controls are placed, the fundamental idea behind an engagement initiative gets diluted. The hidden message then becomes ‘we like you, but we really don’t trust you’. Not a very good idea when you are trying to win the trust of your workforce. CA: 4) Spot recognition; As the name suggests the recognition should be on the spot while the current system is quite opposite. The reward is reaching the deserving employee after one week and cash reward is not taken positively by the employee(as seen by the letter written by Dave). The charm of spot recognition is lost in the time period taken by the reward to reach the employee. In addition to the delay, the quantum of rewards is another point to be considered. Dave points out that the amount he did get wasn’t much either. The CEO’s desire to reach the maximum amount of people is a good one, but his budget allocation doesn’t follow up on his intentions. You might be better off not giving any cash award with the recognition than appearing as a cheap-skate. CA: 5) Congratulations Card; It is too formal in rewards system. It does not state the reason behind the reward being given to an employee. Thus it does not serve the purpose of “congratulating”. True. Recognition has to be personal and reinforced socially to really mean something. A award handed out in a town-hall gets its effect from the fact that the recepient is singled out for the praise and everyone present gets to know about it. The problem though is that town-halls and company-picnics are few and far between events. Luckily technology today provides innovative ways to solve this problem without burning a hole in your pocket. CA: To provide the online platform wherein an employee can be recognized immediately after an achievement. The recognition should not be only from managers/team leaders but also from peers. This prevents favoritism also. The recognition system can be clubbed with the cash rewards subsequently in the process. This rewards and recognition system will keep the employees motivated. The engineers and sales staff will strive to achieve and break records. As clear from the R&R Budget Details, some budget is not being issued by the managers and if issued, is not redeemed by the employees. There should be proper training/user manual for the rewards and recognition system to be understood and utilized by all the employees in an effective manner. Join in on the conversation. Leave your congratulations for Chhavi and comments on the solution below.